Discussion in 'Magazines' started by Melancholybaby, Apr 18, 2015. Kate's editorial wouldn't look out of place in Marie Claire, and it also doesn't seem like an appropriate setting for the couple, I don't associate tropical gardens with any aspect of their relationship. It just seems wrong on so many levels. I like Blurred Lines but it's more of an editorial for February non? It's a perfect feature for couples! But I do get the androgyny aspect of it which is quite lovely. 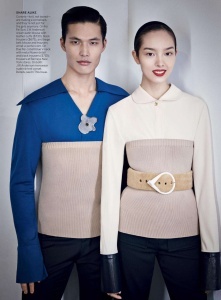 I am fascinated with the fact that Vogue is starting to use Asian models more and more. Come on diversity! Love Blurred Lines. Simple, well styled and perfectly casted. Even the most disposable of UK reality show stars seem to be pictured on holiday all the time, so it's not something I uniquely associate with anyone - and I always thought of their partnership as more of a 'dirty rocker boy' sort of thing, rough and ready in London. Certainly something more interesting than a bland editorial like that. What an uninspired issue,, with the two fresh photographers delivering the worst edits. I think I'll actually take this months Bazaar over this. As much as I hate it at least they kept it season appropriate. 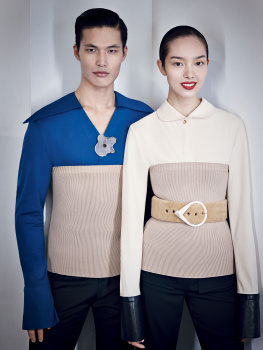 I'm so bored of that background in every single of Demarchelier's studio shoots. 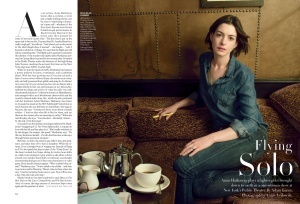 Anne Hathaway NEVER looks like Anne Hathaway in her Leibovitz photos - see her previous Vogue cover and Gap ad. Do her Leibovitz shoots use a lot less eye makeup than she usually wears in other shoots, movies and events? Great quality for an actress if that's the case - apply eyeliner and it's like the difference between night and day. I actually see what you mean now. 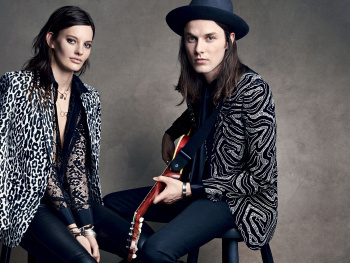 Jamie does indeed have that 'dirty rocker' vibe which was clearly slated away because it's Vogue. Probably Vogue intended this to be more of a fashion story than a depiction of Kate & Jamie's personas, which is odd because Kate's got such an overwhelming presence. I like most of the shots of Blurred Lines. The styling is on point. It looks like this Lucky Blue person will become a 'thing' now. It will be interesting to see how it all pans out. blurred lines is interesting. different models, a bit of a change. i like it. 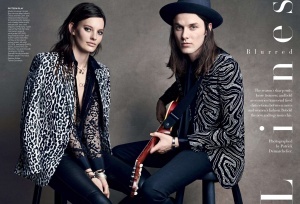 Guys apparently there's a missing ed from US Vogue with Joan and Cameron by Cass Bird, does anybody have it? Thanks for the heads up, Kate! I've just seen it and I must say I love it. I cannot believe Cass shot this, it's flawless. Especially Cameron's shots. Vogue must continue to work with her. There's something really effortless about her work which I like a a lot.